Performed sewing if one would ask. A great honor would be her task. And would forever keep her faith. One of seventeen, Betsy was the eighth. She eloped with her friend John Ross. Proved to be Betsy’s first great loss. A third was very sickly notes recall. She maintained a business through this all. As George Washington shared her pew. When that sermon was all through. To attend a meeting they would address. Formed by the Continental Congress. She knew how important this was to do. And the colors red, white and blue. Placed in a circle they all should be. And stand for freedom and liberty. As the stars in a constellation. That would be Betsy’s own creation. And white means to secede. And one stripe for each colony. Betsy Ross~~ a heroine in our history. Even if she did not make the first flag — even if the visit by George Washington never happened — Betsy Ross was an example of what many women of her time found as the reality in time of war: widowhood, single motherhood, managing household and property independently, quick remarriage for economic reasons. She was born Elizabeth Griscom in Philadelphia, Pennsylvania, to Samuel and Rebecca James Griscom. John was killed in January 1776 on militia duty when gunpowder exploded at the Philadelphia waterfront. In 1777 Betsy married Joseph Ashburn, a sailor, who had the misfortune of being on a ship captured by the British in 1781. He died in prison the next year. In 1783, Betsy married again this time, her husband was John Claypoole, who had been in prison with Joseph Ashburn, and had met Betsy when he delivered Joseph’s farewells to her. He died in 1817, after a long disability. 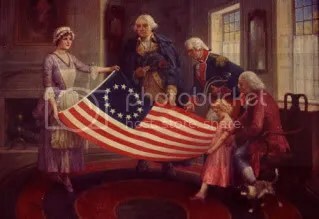 Betsy Ross died at the age of 84 on January 30, 1836. Mary Young Pickersgill sewed the very large (30’x42′) Star-Spangled Banner in the summer of 1813. It flew over Fort McHenry during the War of 1812 (1812-1814) and was the inspiration for Francis Scott Key to write what would become our National Anthem.